Moments before Revival Kitchen filled up on a pleasant summer Friday evening. Before my wife and I left our Port Matilda home we learned that an accident, combined with the usual Penn State move-in weekend madness, made US 322 a bad option for getting down there, so we took a back way through Belleville to reach Reedsville. This really sets the mood for a farm-to-table restaurant like Revival Kitchen, as this route takes you through some prime Pennsylvania farmlands. In fact, its location makes Revival Kitchen a sort of sibling-in-spirit of another Central Pennsylvania local dining hot spot, Elk Creek Cafe + Aleworks. 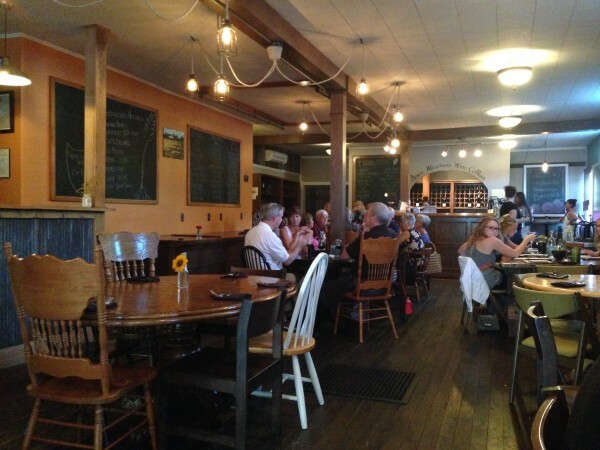 Like Elk Creek, Revival Kitchen is located in the center of a small town in Amish/Mennonite country, so on the way in you’ll probably see horse and buggies (and evidence of horses right there on the road, if you will). 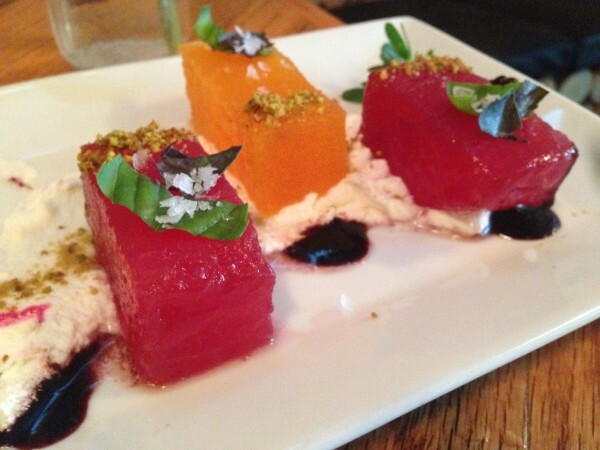 Also, Revival Kitchen and Elk Creek have a feel of a hip urban restaurant in its decor and ambiance. And both really knock it out of the park as far as innovative food served with local ingredients. Upon entering Revival Kitchen, you are greeted by a very friendly staff. The hostess is cheerful, and our waiter that evening was friendly and helpful. While some restaurants give you a feel of a staff going through the motions, Revival Kitchen reminds me of Elk Creek in that the restaurant’s crew seems to really buy into it, and are enthusiastic. The restaurant is rather small, with rural-hipster-rustic decor and a very nice combination of natural and artificial lighting. One note: The restaurant is BYOB for beer and spirits, but it is associated with Seven Mountains Winery. They have a Seven Mountains wine bar in the back, and that is where you go to get your wine. You will not get it from the waiter because of Pennsylvania liquor license weirdness. My wife wanted to start off with the coffee-roasted beets that I had raved about. This simple dish is a testament to Chef Wicks’ creativity. He coffee-roasted three kinds of beets and topped them with beet chips from Village Acres and his own cultured cream and hazlenuts. Broken coffee pizelles rounded out the dish. This is a combination that will convert even the most hardened beet-o-phobe. As a treat for our anniversary, a melon appetizer was brought over. Made with a tasty cheese, balsamic vinegar, and topped with herbs and salt, a variety of different watermelon really made this dish shine. Presentation was extremely colorful and they almost looked like sashimi. The homemade gnocchi was my wife’s selection, and this dish was like no other gnocchi dish we’ve ever had. It seemed to be sauteed, and was served with a variety of local vegetables. This included rainbow carrots, zucchini, squash (cut into balls which made them hard to identify), spinach, and the tasty “weed” known as purslane. Byler Farms goat chevre cheese and lemon nettle butter completed the dish. It is a perfect vegetarian offering. My selection was more carnivore. I chose the short ribs and mushrooms. This dish featured a tender beef short rib cut, with three types of mushrooms in a brown sauce, served over cheesy polenta. All I can say is, wow. The cheesy polenta counteracted the tang of the brown sauce, and the short rib was cooked to perfection and melt-in-your-mouth tender. This is a hard cut of meat to do well, and they do it great. For dessert, we shared a peach dessert that was something of a parfait. Using our current bounty of local peaches, it offered a nice, light summery end to our meal. All-in-all, Revival Kitchen lives up to its current hype and is well worth the trip down Seven Mountains for State College foodies looking for the latest and greatest. They do require reservations, which can be made by calling (717) 667-7089.